No matter what part of the world you live in, you'll probably be a part of someone's Easter traditions. Easter is a time when families gather and rejoice in the celebration of all that is new and fresh; a rebirth if you will. In the private jet industry it tends to be a time when we see an increase in the number of children on board - expecting colored eggs, marshmallow bunnies , baby chicks and lots of chocolate! It's a time when your passenger expectation is focused on spring lamb, fresh garden vegetables, egg dishes, and freshly baked holiday breads. Knowing a bit about your passengers' holiday traditions can make the flight all the more enjoyable, so let’s start with some Easter information. Easter is a Christian holiday celebrating the resurrection of Jesus Christ. Catholics and Protestants gather in churches across the globe with rituals and celebrations based on their community and its traditions. Easter is more than on day; Easter Week begins with Palm Sunday and culminates in the weekend celebrations of Good Friday, Easter Saturday, Easter Sunday and (in some countries) Easter Monday. Those Christians who practice a more strict regime will observe 40 days of giving up things for Lent. Their food choices may eliminate an item that is dear to them. They sacrifice something for those 40 days in order to be rewarded with a feast at Easter. Children may give up candy or desserts - or maybe meat. The choice is personal. The Easter feast following Lent might include Kielbasa, Babka, or Chalka baking, and a lamb cake covered in cream cheese frosting, with raisin eyes and a red ribbon or red licorice to represent the Pascal lamb. In our family we always serve lamb, ham, beef tenderloin, and an endless array of salads with deviled eggs ready to pop in your mouth. The selection of baked foods is overwhelming. I come from a family of cooks and our offspring love to cook as well. We have asparagus and other baby spring greens prepared by one of the many family members attending dinner and always with kale salads which represent end of winter. My sister always makes the lamb cake (which now is actually an Easter Bunny cake) covered in a cooked fluffy white icing. The rabbit has pink colored coconut in the center of its ears, jelly bean eyes and licorice whiskers. The small children - and we have 30+ small children under the age of 10 in our extended family - all have a chance to swipe their fingers through the meringue-like icing for a secret lick before dinner, but are always given away by the smudges of icing on their faces! The food served varies by community and family as much as any other Easter traditions. From flying kites (Bermudians celebrate Good Friday by flying home-made kites, to represent Jesus’s ascension into heaven) to eating codfish cakes, and Hot Cross buns. From creating floral sidewalk murals, to throwing water on young women or decorating town fountains with flowers and eggs. As an aviation caterer, I use this information to create special gifts for the children on board or decorate the cabin with pieces of their own traditions reminiscent of the holiday. I'm not talking about going crazy with decor as many of you might think I would, but a simple reminder to the passengers’ local tradition. 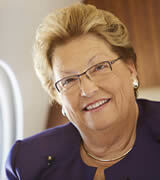 Say, for example, our passenger was Norwegian. What would bring a smile of recognition to his face? I would suggest a mystery thriller on board, or some mystery movies ready to view . . . something that would reminded them of a Norwegian holiday tradition known as Paaskekrim or 'Easter-Crime'. Let me move forward to some classic Easter folklore. 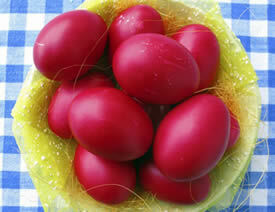 Traditional Easter food and some of the unusual practices go back as far as an estimated 33 BC. Ever wonder where the idea of a decorated colored Easter egg comes from? why we have chocolate bunnies? or what flowers are associated with this season? Easter Eggs - believed to come by way of an old pagan story about Eostre, a goddess of spring and fertility. “According to folklore, Eostre found a bird dying from the cold and turned it into a rabbit so its fur would keep it warm - but that rabbit still laid eggs like a bird.“ Other versions of the lore say the bunny paints and decorates the eggs as a gift to Eostre to show his loyalty and love for being rescued. Some think the word Easter is a variation of the name Eostre. Coloring eggs is thought to have a deeper religious connection as well: According to the author of 'Inner Journey to Easter', one tradition regarding Easter eggs is related to Mary Magdalene, the first person to see Jesus after the Resurrection. She was holding a plain egg in her hand while in the presence of an emperor proclaiming the Resurrection of Jesus Christ. The emperor said that Jesus’ rising from the dead was as likely as that egg turning red - and the egg turned bright red while he was still speaking. 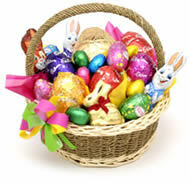 Thus the Easter egg hunt is a tradition that originated with pagan spring festivals that celebrated fertility. In some countries the painting of the eggs is done with painstaking time and skill . . . they are works of art. If on your flight you want to have eggs, you can also use egg shaped cookies, beautifully decorated. In Sweden, Easter is celebrated with meals of eggs, herring, and Jansson's Temptation (potato, onion and pickled sardines baked in cream). The most interesting tradition to come out of Sweden is that in the days leading up to Easter Sunday, the children dress up as Easter witches, wearing old and discarded clothes. They go from home to home in their neighborhoods, trading paintings and drawings for sweets. In Mexico, Spain and Italy Cascarones are used as celebration gifts. After you drain and dye the eggs, they are stuffed with some sort of confetti such as birdseed, glitter or even little candies, and are then sealed with glue and tissue paper. Be careful if you purchase these for the aircraft décor or Easter baskets as you will have an endless clean-up from debris buried in the carpet for months to come. 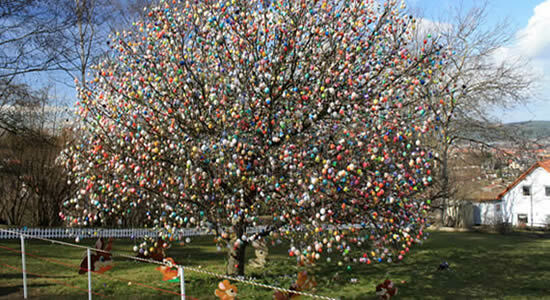 In Germany, the residents of some towns decorate trees with decorated and plastic eggs. This tree is the pride of the town with thousands of eggs. Many are painted in amazing detail with landscapes and town scenes, and some are even covered in crochet netting and sequins. In other areas of Northwestern Europe, people light large bonfires called 'Easter Fires' on Easter Sunday and Easter Monday. Originally this practice was believed to be from a Saxon tale stating that “Easter is a time when spring becomes victorious over winter, and the fires were to chase the darkness of winter away”. Today the nights are festive with heavy consumption of gin, lager, and snacks. Something to note for aircraft staples . . . not the fire, just the booze. A simple battery lit candle would be a nice recognition of this festivity on board. In the city of Haux, France, the Easter egg takes on a different meaning. On Easter Monday over the last 30 years, numerous chefs build a fire in the town square to cook an omelet large enough to feed the entire town - it's lunch for up to 1,000 people. Imagine a custom made skillet 10 feet in diameter filled with 5,211 scrambled eggs, 21 quarts of oil, and 110 pounds each of bacon, onion, and garlic. The story behind this Easter tradition is related to an instance during Napoleon's reign when the general demanded a giant egg dish be prepared for his soldiers as they passed through the countryside. Where do all the chocolate bunnies, eggs and rabbits come from? We can thank the French and Germans who started the chocolate tradition in the 19th century which has now spread the world over. To receive one of these chocolate eggs, children were told to make nests from hats or baskets so the Easter Bunny could leave them there during the night. And so the Easter bonnet and the Easter basket tradition took hold. In Poland on Easter Sunday, families come together over a massive feast to wish each other health and happiness for the rest of the year. A lamb-shaped cake or mould of butter is a typical tabletop centerpiece (this moulded lamb shaped butter can be found in most markets this time of year, and can be ordered or picked up for service on the aircraft), while eggs in all forms - fried; boiled; halved and stuffed - are passed around as tokens of good blessings. In addition to Zurek, a hearty white sausage soup known for its pungent taste, hungry celebrants feast on ham and cakelike breads such as Babka and Chalka. I digress a bit. Not only are there baskets filled with sweets for the children but there is a tradition called the blessing of the basket. In Poland, blessing of the baskets is known as święcenie pokarmow wiełkanocnych, a practice dating to the 15th century or earlier, and one which is still maintained Eastern and Central Europe on Holy Saturday. A typical basket is lined with a linen napkin and covered with a plain white cloth to symbolize the shroud of Christ. It would include symbolic foods such as those listed below, and can be presented on board. Bacon - Boczek / Słonina (BOH-chek / swoh-NEE-nah) -- Symbol of the abundance of God's mercy. Bread - Chleb (hlehb) -- The staff of life given by God. Easter Bread - Babka (BAHB-kah) -- A round loaf of rich, eggy, yeast dough with raisins reminiscent of the risen Lord. Butter - Masło (MAHS-woh) -- Dairy products are included to celebrate the end of Lent and the richness of our salvation. Butter is often shaped into a lamb (symbolic of the Paschal Lamb) and known as a baranek. (When the baranek is made of sugar, it is known as baranek cukrowy wielkanocny). Sometimes the baranek is made of dough, wood or even plastic. Candle - Świeca (SHVIEH-tsa) -- The candle symbolizes Jesus, the Light of the World, and can be lit during the blessing by the priest. Cheese - Ser (SEHRR) -- Cheese is a symbol to remind Christians of moderation. Colored Eggs - Pisanki (pee-SAHN-kee) -- Both colored and uncolored hard-cooked eggs indicate hope, new life and Christ rising from his tomb. Ham - Szynka (SHIN-kah) -- Meats are symbolic of great joy and abundance in celebration of Christ's Resurrection. Sausage - Kiełbasa (kyehw-BAH-sah) -- The sausage links are symbolic of the chains of death that were broken when Jesus rose from the dead as well as of God's generosity. Horseradish - Chrzan (HZAHN) -- This is a reminder of the bitterness and harshness of the Passion of Jesus and the vinegar it is mixed with symbolizes the sour wine given to Jesus on the cross. Salt - Sól (SOO) -- Salt symbolizes is represented to add zest to life and preserve us from corruption. In Australia, you will not find chocolate Easter Bunnies, because they are considered a pest . . . a crop destroyer, so they get their chocolate eggs from the Easter Bilby, an endangered indigenous rodent with rabbit like ears. 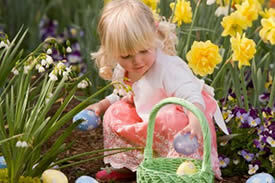 Children play an important role in the origin of the fun side of Easter. For Christians, this is a serious holy day, dealing with issues of life and death. These are difficult to understand for children so we see a more fun-filled playful way to use the symbols of Easter such as egg hunts and egg races. In Scotland and many other countries this festival has egg and spoon races, egg rolls down grassy hils and other egg related games. On Easter Sunday, children in Australian and Bermuda get their Hot Cross buns, traditional sweet buns marked with a symbolic cross that is scratched into the unbaked dough to symbolize the crucifixion of Jesus. Bermudians add codfish cakes to their Easter food choices. If you are hosting English passengers on board the Tuesday before Lent , be sure you are serving pancakes on board. It's a famous holiday tradition called Pancake Day. This is the same day that Mardi Gras is celebrated in many cultures, called Shrove Tuesday. It is considered a major part of the Easter tradition. In many cultures a typical Easter food is lamb. “Lamb is traditional because Jesus' last supper was the Passover meal. If Jesus ate meat during that meal, it would have been lamb.” But not all cultures have lamb . . . they may eat pork or goat. In Peru, on Easter Saturday they celebrate a feast of 12 traditional dishes. A favorite is Chiriuchu, a mishmash of dried corn and mixed meats, including roasted guinea pig. Peruvians commonly wash down with Chicha, a regional beer made from fermented maize. Feast tables in Greece musts include fogatses (a Venetian-style brioche), hard-boiled eggs dyed in deep shades of red (to represent the body of Christ), dove-shaped cakes known as Kolompines, and Tsilihourda (which the rest of Greece calls Mayeritsa, a soup of minced lamb tripe). Understanding Easter from more than just the marshmallow chocolate bunnies, chicks and eggs should enable you to better serve your Easter travelers. Easter is time of celebration . . . of spring, of youth, of vitality, of rebirth and holds wishes for a happy year to follow. Easter Sunday falls on April 21st this year.